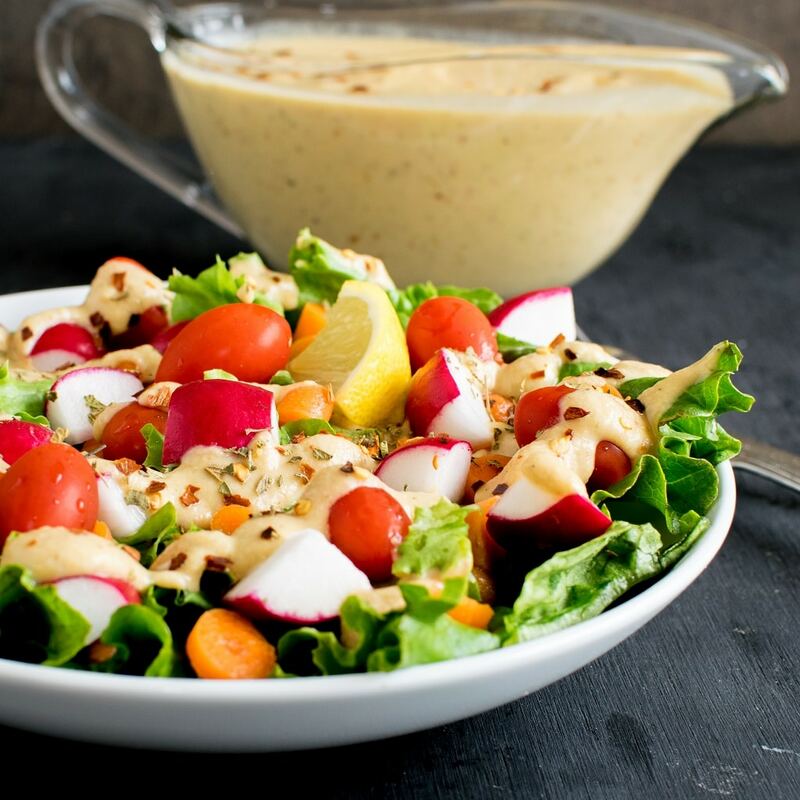 Vegan Chopped Salad with Chickpea Sour Cream Dressing is a sumptuous way to include protein in your diet. I am excited to find out this new idea of a chickpea dressing. However, it’s not a hummus. Since the weather is warmer we tend to desire for light and cool food and so salads occupies the top most items on the menu. My idea of a salad is a wholesome and complete meal. A combination of good carbohydrates, protein, good fats and loaded with vitamins and minerals is what I am always desire for my salads. Even though there isn’t significant carbohydrate in this salad but it is definitely a complete meal. I prefer salads for my lunch when the sun is at its peak. The cool and fresh crunch of lettuce along with sweet and juicy cherry tomatoes feels perfect on my taste buds. With some more added salad ingredients I am absolutely happy with slightly drizzled homemade dressing. Therefore, chickpea sour cream dressing is the hero of my salad. For the dressing, I blended boiled chickpeas along with aquafaba, vegan sour cream (Tofutti), some herbs as seasonings and drops of lemon juice. Isn’t it super simple? Also this dressing serves well as a sandwich spread. I like to make this dressing in a bigger quantity and store it in the refrigerator and use it as and when required. This way I am always ready with the dressing or a dip. The only thing left to do afterwards is to assemble the salad ingredients and drizzle the dressing over it. 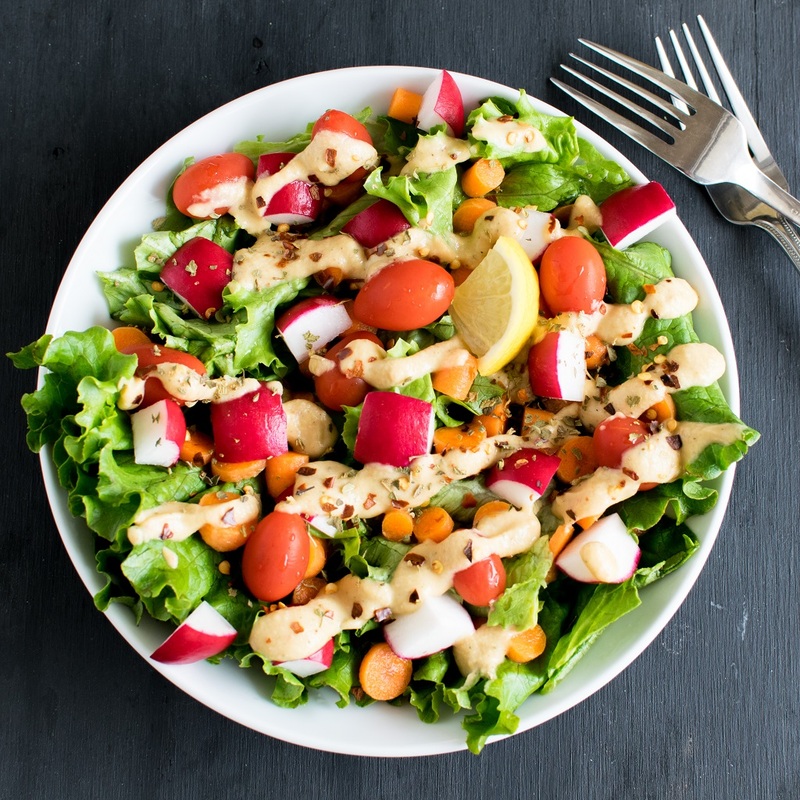 Just enjoy this nutritious and healthy Vegan Chopped Salad with Chickpea Sour Cream Dressing. With minimum ingredients and in just few minutes a delicious and nourishing meal is ready. Enjoy it as a lunch or a dinner this salad is definitely desirable. It is a great lunch box food item as well. Some boiled pasta goes very well in this salad and feel free to add some spinach as well. 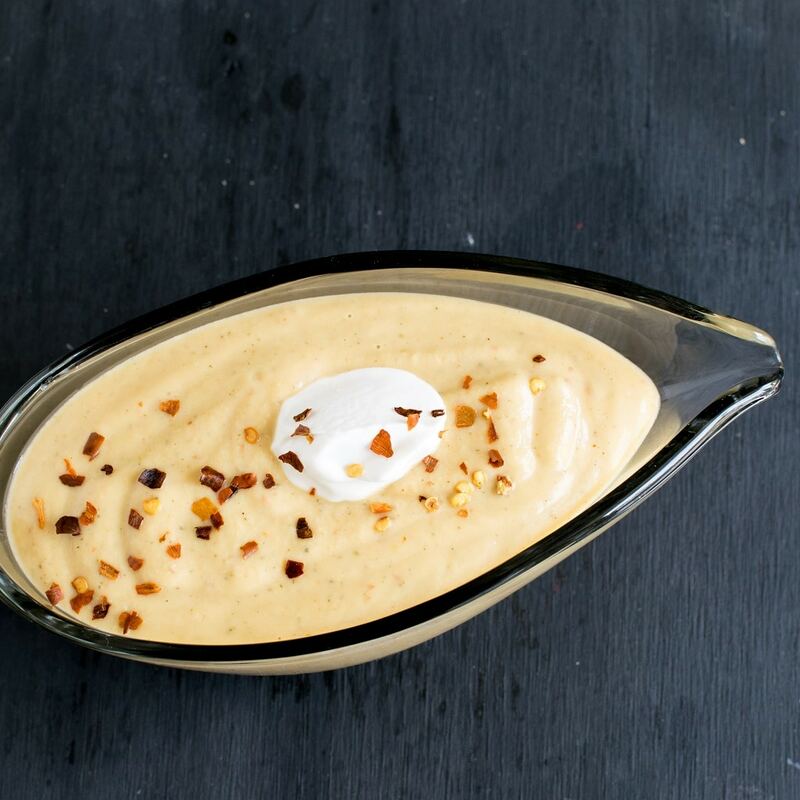 In a blender combine all the ingredients of the dressing and blend it smooth. Now, assemble all the salad ingredients in a salad bowl and toss in the dressing. Adjust salt, chili flakes and lemon juice according to taste and enjoy. You can use any salad ingredients of your choice. Steamed broccoli also goes well in this salad. Feel free to add some boiled pasta to make it a wholesome meal. Roasted Brussels sprouts also tastes good in this salad. This looks so good and healthy! And that dressing sounds delicious! That dressing sounds divine!! I think I would drizzle on many things – even roasted veggies and buddha bowls! Perfect for summer! Great idea. I do the same. 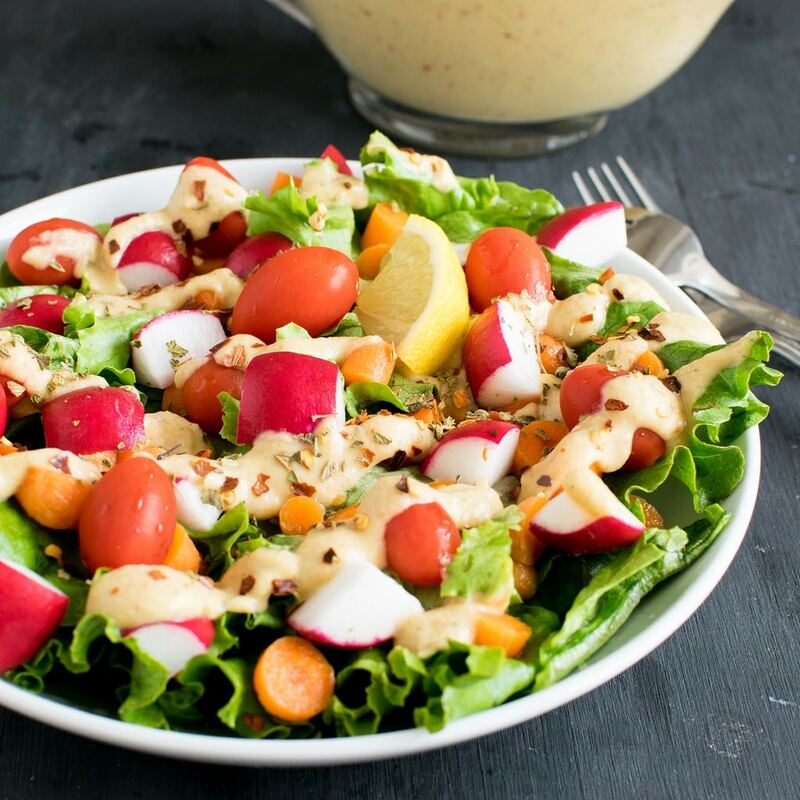 What an amazing idea to put chickpeas in a dressing, you have inspired me to try this out! Thank you Jasmine. Hope you like it. 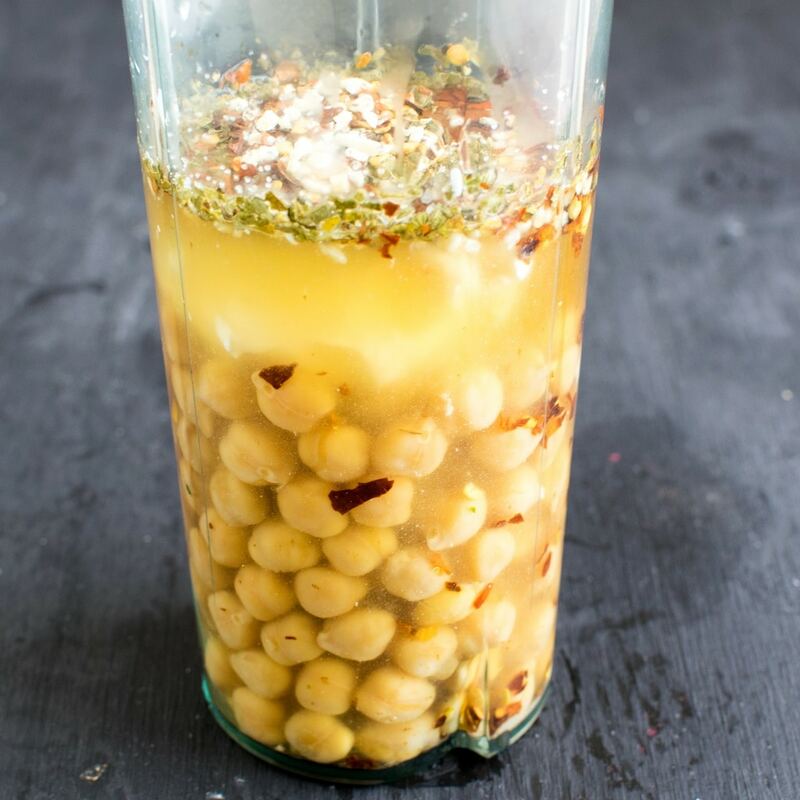 Wow, I’ve never thought of using chickpeas and aquafaba to make a chopped salas dressing! Love this creativity and freshness. Thank you Sarah. It really is delicious.